Not That One…the Other One! I think Evan Bourne being out of action for possibly the next few months will affect the already low amount of time I spend watching ECW. His matches were definitely ones that I wouldn’t fast forward through. Other than having to sit on the sidelines when you are on a hot streak and being given a major push in the promotion, what’s the worst part of severely injuring your right ankle in a match? Having to sell the left one because that’s what your opponent(s) are beating on. If you didn’t see the tag team match on ECW last week, Bourne did a somersault outside the ring on Bam Neely (another shameless plug for Bam) and came down wrong on this right ankle (we’d later find out that it was a dislocated ankle and ligament tear). After the injury, he finished out the rest of the match with his opponents working over his left leg for the duration. I was cringing watching it because I was aware that it was the wrong wheel. And I knew that to do a good job selling the left leg he would have stop using it. So for about ten minutes he had to hop around on his dislocated, torn right ankle to let everyone know how badly the left one had been pummelled. 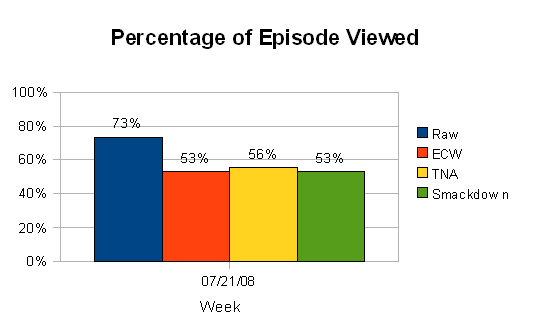 A few weeks ago, I decided to keep track of my viewing time of WWE Monday Night Raw, ECW, TNA, and WWE Smackdown over the period of several months to see if I’m able to tell anything about the direction of the quality of the programming (e.g. am I watching less, more, or about the same). Still haven’t worked out how I want to show week-to-week changes for each promotion. I think I’ll only show those once a month, but I haven’t really thought any more about how to display it. The WWE had a Pay-Per-View on 7/20/08. What seems to be the trend is that after a PPV the first part of the programming consists of speeches and interviews related to the outcome. 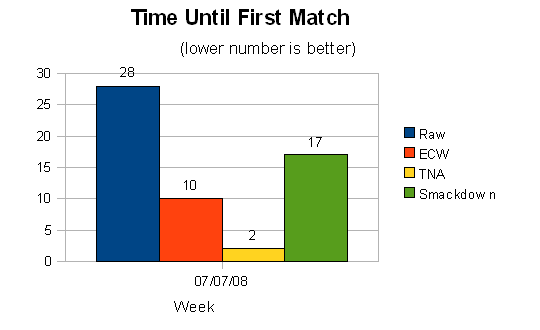 I would expect the “time until the first match” to increase. 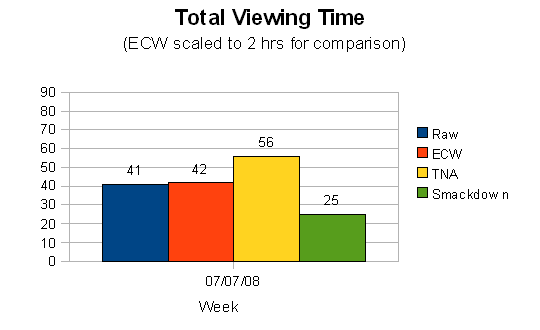 Both Raw and Smackdown increased, but ECW dropped by 5 mins. TNA was about the same as last week. Partly because I hadn’t read up on any PPV results, I watched more of the Raw program this week to find out some of the match outcomes. 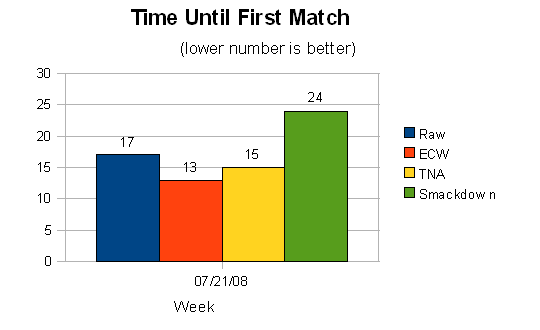 ECW was identical to last week, TNA down a bit, Smackdown up. Smackdown was up because of finding out that Bam Neely is not a mute. In his early days, the wrestler now known as Bam Neely spent a lot of time wrestling in a tag team with his uncle. They were known in the area as Blood and Gutz– The Hellraisers. Blood had wrestled several years before in a tag team with someone I believe was his real life brother. I think the team was called the Blood Brothers, but don’t quote me on that. Although the following match is unstructured (it’s pretty much a free-for-all at times), and it’s definitely not their best match as a tag team, I thought it would be worth posting to see four guys having fun beating each other up at a bar. This match originally aired on “Slick” Mick’s Bodyslam Review, hosted by Mick Karch and produced by Al Pabon. It was taped at Sharx in Fridley, MN. I believe it was in 1998. Since there seems to be a lot of interest in ECW‘s Bam Neely (a.k.a. Hellfire, Gutts, Gutz, Magnus Maximus, etc., etc. ), and not a lot of information on some of his earlier work, I went digging around to see if I had any footage of some early matches. Turns out it would have been easier for me to create a Claymation re-enactment of this match than to dig through a pile of tapes to find it. Should have done a better job of indexing this stuff. 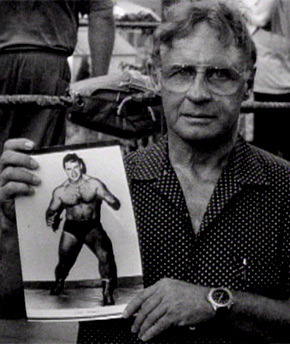 As I think I mentioned before, both he and Prime Time had initially trained with another wrestling promoter and had a few matches before coming to Eddie Sharkey and Terry Fox‘s training camp. I believe this was their first match after switching to Sharkey. This match originally aired on “Slick” Mick’s Bodyslam Review, hosted by Mick Karch and produced by Al Pabon.